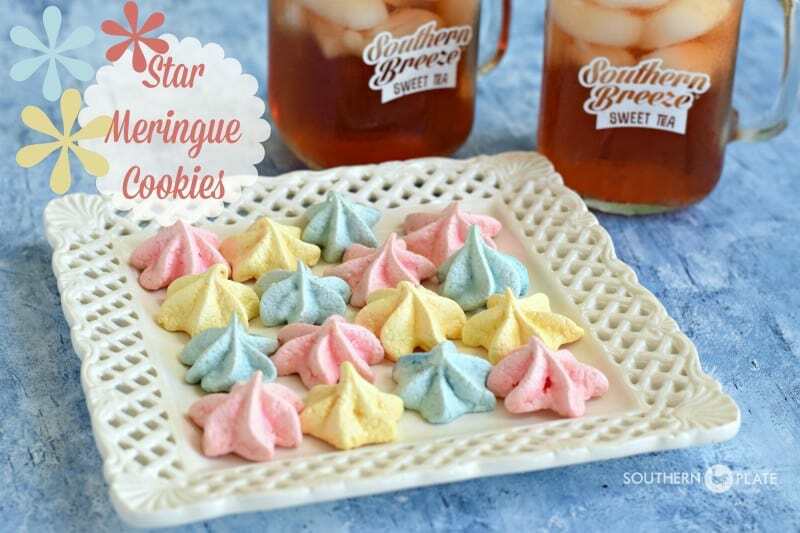 Today I’m bringing you a simple meringue cookie that is really more like a confection. It melts in your mouth and has the perfect touch of sweetness. My sweet daughter, Katy, loves these cookies. I usually make them for her around Christmastime with chocolate chips added, but we also enjoy them in their original form like these. The ingredients are as simple as can be and two eggs yield well over 50 little stars, but a little less if you just spoon them out onto the baking sheets rather than pipe them (which is how I do them most often). You know, teachers can make or break a school experience. Just about all of my teachers made mine much richer and more enjoyable. My children have had some wonderful teachers as well, before our homeschool days began (although I hope they like their teacher now!). But when a child is first starting out, teachers have an even stronger influence. These wee ones are looking to that elementary teacher as a surrogate mother. Their insecurities of being away from home are either put at ease or heightened depending on the teacher’s attitude. I remember when Katy was two, I had her enrolled in a mother’s morning out program and a few weeks after she started a new teacher took over her class. Katy’s attitude towards school changed drastically after the first a week with her new teacher. I asked her about it one morning when I could see dread building up in her expression. She looked at me with her little toddler face and said, “Mama, looking at me makes her mad. She just gets mad as soon as she sees me. She just doesn’t like me very much.” You can imagine how much this hurt my heart to hear. I talked to some other mothers and found out that their children also felt that they “made their teacher mad”, seemingly the moment they walked in the door. After a long talk with the director about the problem, I pulled Katy that day. It’s heartbreaking to know that there are some people working with our kids who really don’t like children, but chances are many of our kids have encountered at least one of them at this point, so there is an understandable heightened sense of anxiety when it comes to meeting a new teacher. Today I’m going to tell you one sentence that teachers can say to set a young child’s heart at ease. Years and years ago, Brady had just gotten used to his kindergarten teacher and was really looking forward to school each day when he had his first substitute teacher. The regular teacher let us know ahead of time and I could tell Brady was a little nervous, but I was even more so. I had served as a substitute a fair amount at this point and had been privy to seeing mostly loving teachers but a few who fell into the category of not being the most kid friendly. The thought of drawing the short straw with children so new to school just about made me sick. I said a little prayer and sent him off, hoping for the best. He couldn’t stop beaming all evening, feeling as if he had made this sweet lady’s day just by his very existence in that classroom. This brilliant woman came in and set expectations up right from the beginning that these kids were highly valued and a treat for her to be around. Where they had fears of what this stranger might be like, in one sentence she waylayed every single one. From then on out that became my opening statement to every class I taught and each time I said it you could just see a wave of relief spread throughout the room. I know a lot of teachers will read this and I know you teach out of love for kids (ain’t nobody here fool enough to think you do it for a fat paycheck ~wink~) so I just wanted to share that experience with you in case you might need a little inspiration from a magical sentence. And as a mother, I also want to thank you for dedicating your life to loving, helping, and guiding those precious little ones who are entrusted to you. 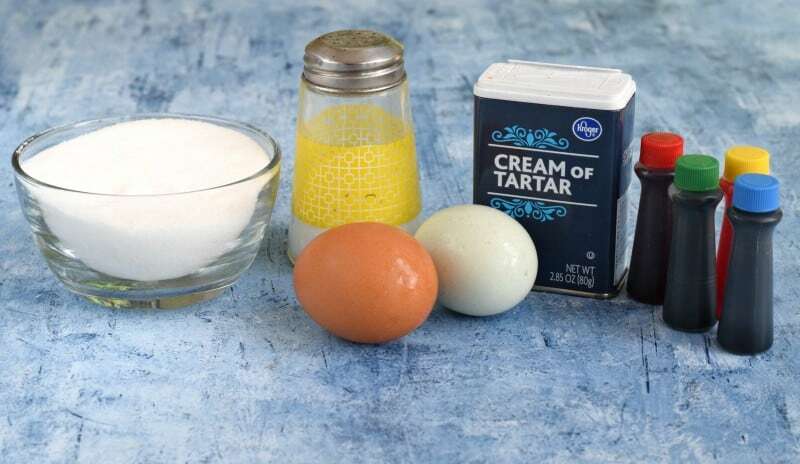 To start with, you’ll need: Sugar, Salt, Cream of Tartar, Eggs, and Food Coloring. 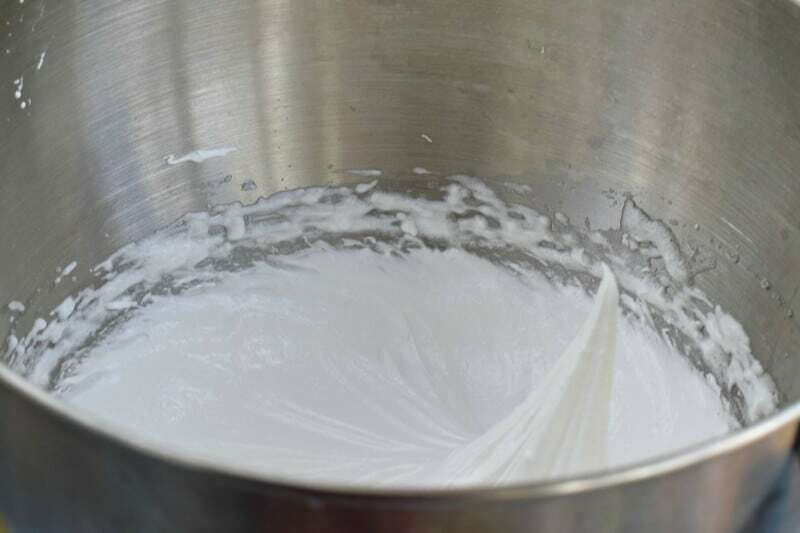 Place your egg whites, salt, and cream of tartar in a very clean bowl and beat with an electric mixer until foamy, like this. Make sure you use egg whites only. If you have any of the yolk (orange part) it won’t work. You also need to make sure your beater and bowl are free of any oily residue because that will cause issues as well. See how that one part where I pulled my beater up is still sticking up? That’s a stiff peak. Now you’re ready to either spoon this out into cookies and bake or tint it with food coloring. 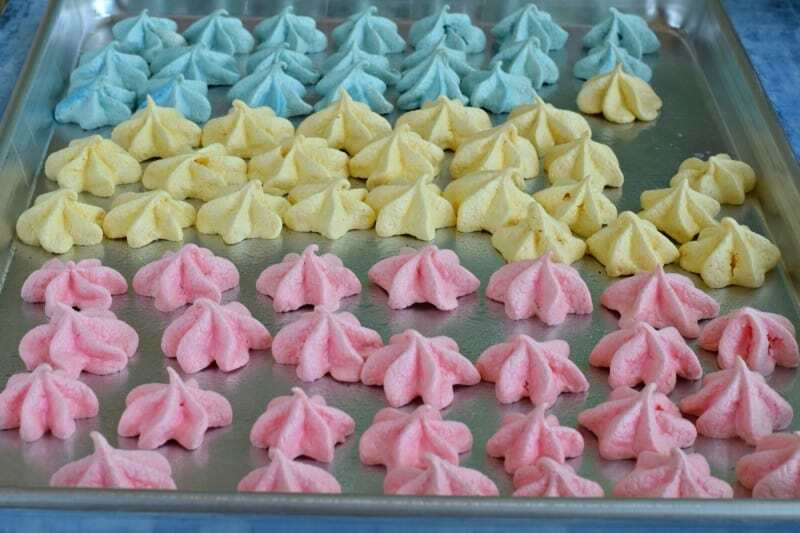 Coloring your meringues is completely optional. Most times I don’t color them. 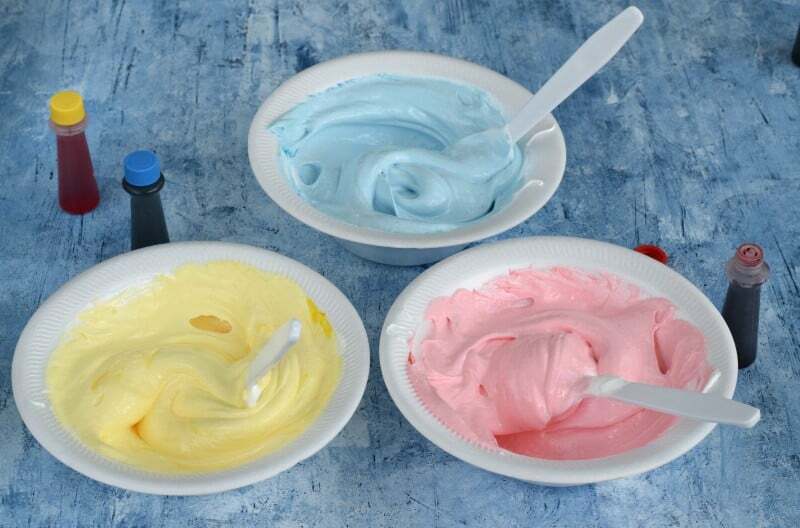 If you want to, though, just use regular old food colors like you get at the grocery store, divide the meringue into however many colors you want, and add several drops into each bowl. 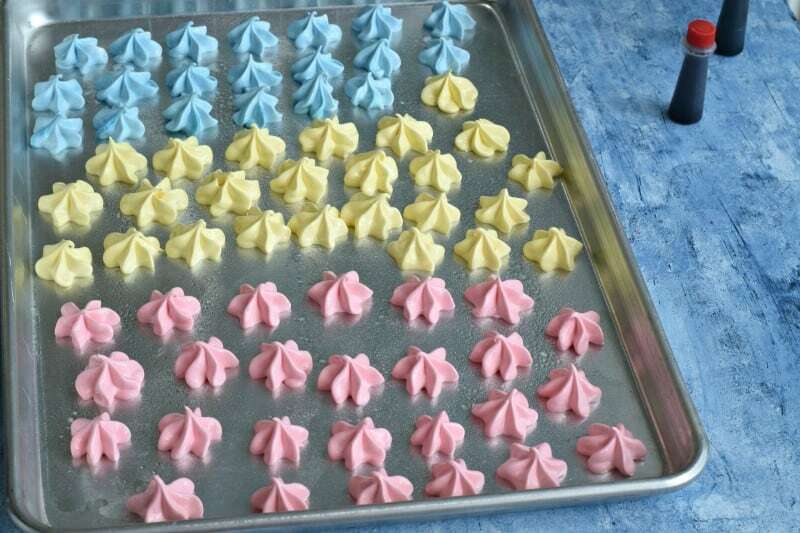 Here are our pretty little meringues. Now most of the time I just spoon these out onto a greased baking sheet, like I did when I showed you the chocolate chip version, here. But today I am making them pretty for you by placing a large star tip in the bottom of a plastic zipper seal bag with the corner cut off. Spoon a bit in your bag and just pipe it out into stars all over your greased baking sheet. Once you have these ready to go on a greased baking sheet, bake them at 300 for about twenty minutes, or until *very* lightly browned on the bottom and kinda dry looking. They will look like this. They might actually be glistening a little more but they will dry more as you bring them out. As soon as I get mine out I like to take a spatula and run under the bottom of them just to move them around a bit. This keeps them from sticking as they cool. As soon as they are cool I put them all in a zipper seal bag or sealing container of some sort to protect them from moisture. They will be good for a very long time, a week minimum, but they won’t last that long! Look at all these pretty little stars. Light as air and melt in your mouth delicious. Now, what should we add to this little treat? Ahh yes, it’s August summer is getting ready to wind down and we need to savor it just a bit longer. 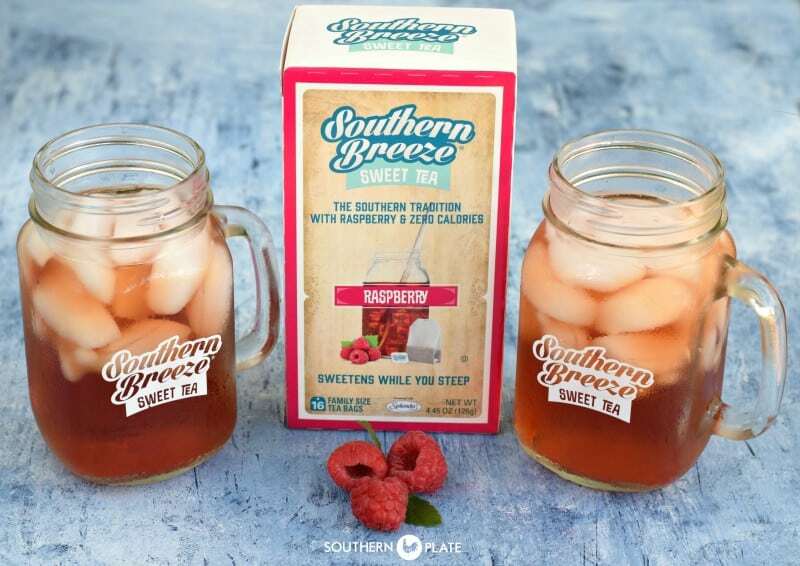 I am loving the fruit tea flavors from Southern Breeze. I’ve never tasted fruit tea before because it had so much sugar, but these tea bags are presweetened and have zero carbs and zero sugar so a whole new world has opened up to me. 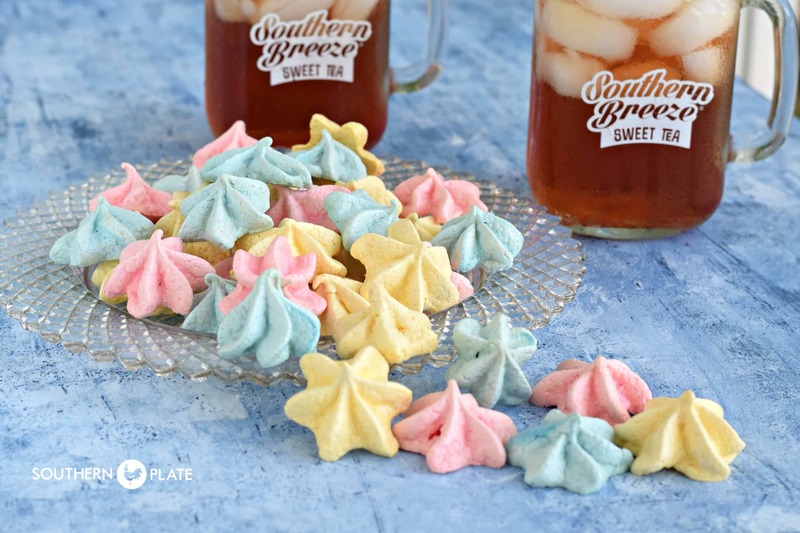 A few weeks ago we tried the regular Southern Breeze Sweet Tea (also zero carbs/zero sugar) and Ricky and I found this to be the closest to the authentic tasting Southern tea that we’ve ever had. Last week we tried Peach. Mercy, it is amazing. This week, Raspberry was our flavor of choice and it didn’t let me down. I make this tea right in the jug and the perfect amount of sweetener is in the bag. You can visit this post and scroll down to see how I make it right in the tea pitcher. Visit their website and use the product locator link to find it in stores in your area by clicking here. There is also a $1 off coupon there so make sure you grab that before you head out. One of the places I shop at doesn’t carry it so I printed off a product request form from the Southern Breeze website and turned it into customer service. Hey, you never know! Enjoy your sweet respite from the maddening world! 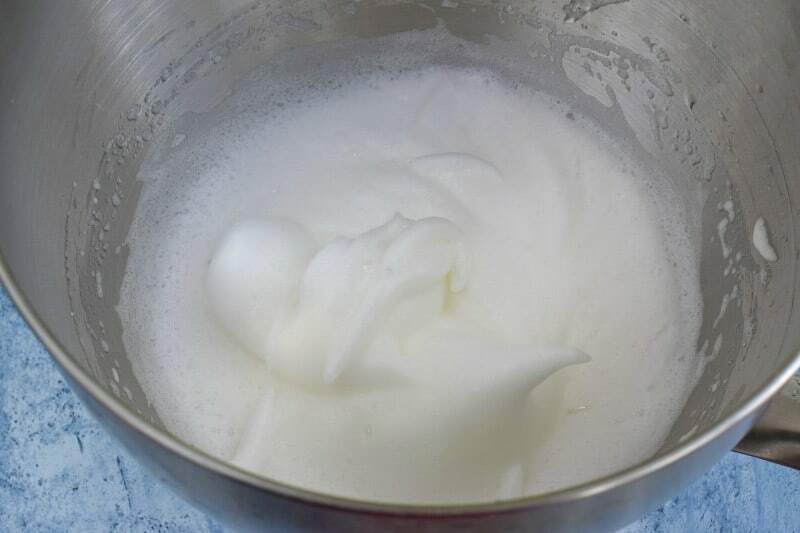 In a medium mixing bowl with electric mixer, beat egg whites, cream of tartar, and salt until soft peaks form. 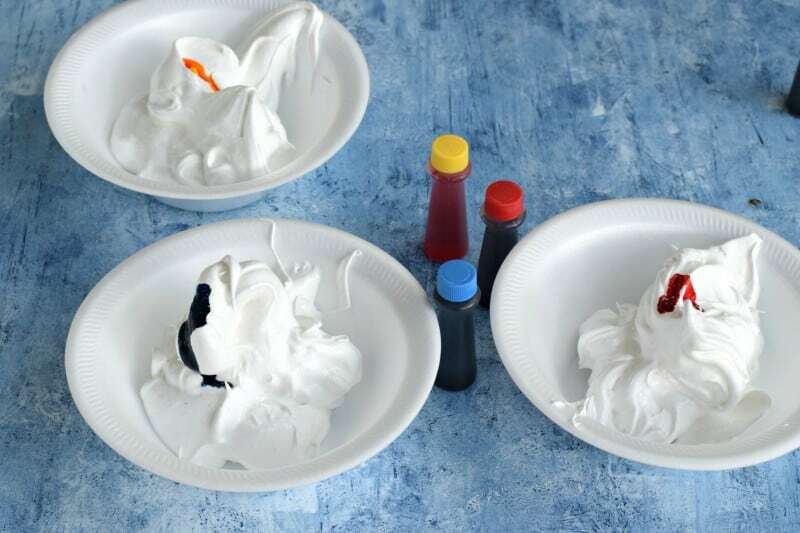 Divide meringue and tint with food coloring, if desired. 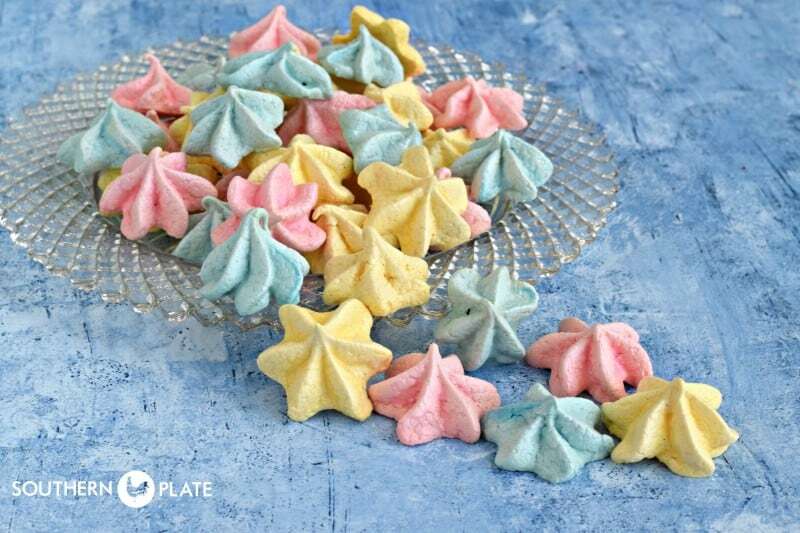 Drop by level tablespoonful onto greased baking sheets (or pipe with a star tip). Bake at 300 for 20-25 minutes or until meringues are dry and crisp. As soon as meringues come out of oven, run a spatula under them to loosen them from the sheets. Allow to continue cooling on the sheets and then place in an airtight container.
! *Be sure you grease your cookie sheets! These sure do look pretty! 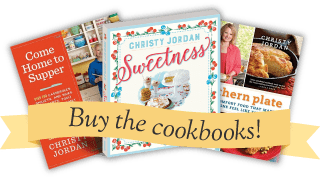 Hi Christy, can I use Splenda in place of sugar for the cookies? Can these be made in advance and frozen? They look so pretty and dainty. I love baking with parchment paper. Can I use parchment paper for these? Thanks and God be with you and your beautiful family always.